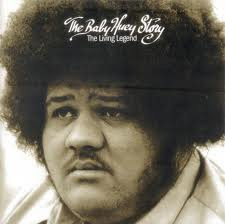 "Baby Huey's only album, released after his untimely death, is titled The Living Legend with good reason. He was legendary in his appearance, a 400-pound man with a penchant for flamboyant clothing and crowned by a woolly Afro, a look that is best illustrated by one of several rare photos included in the Water Records edition that shows our man in a wide-lapeled polka-dot shirt with a lime-green jacket. Beyond his unusual appearance, though, he was graced with a stunning, fierce voice on par with Otis Redding and Howard Tate, wailing and howling one moment and oddly tender and sentimental the next. Nowhere on Living Legend is his range more apparent than the opening track, "Listen to Me," where listeners are introduced to both the enigma of Baby Huey and his diamond-tough psychedelic funk backing band, the Baby Sitters. The high-energy instrumental workout "Mama Get Yourself Together" is worthy of the J.B.'s and a hazy, spiraling ten-minute rendition of Sam Cooke's chestnut "A Change Is Going to Come" confirms that the Baby Sitters could hold their own with Blood, Sweat & Tears. Further lore that catapults The Living Legend from good to great: the production was helmed by Curtis Mayfield, reason enough to make it near essential, and is highlighted by three of his compositions, "Mighty Mighty," which Mayfield and the Impressions recorded a few years earlier; "Running," a classic Mayfieldcut that can only be heard here ripped to glorious bits by a band that is trying to let every member solo; and "Hard Times," which Mayfield himself would revisit on his 1975 album There's No Place Like America Today, although Baby Huey's razor-edged reading remains the definitive version -- no small caveat considering Mayfield not only wrote the tune, but could rightfully be considered one of the architects of soul to boot." Thanks so much and Happy New year to you FunkyBoss!! don't know why..but, seems this Baby Huey Lp link doesn't work.. great lp by the way..
any links to the 45s he put out with the babysitters? All the content provided on this site is for promotion purposes only. We recommend users to buy the original LPs or CDs of the music they like. Once you've downloaded an album, it should be deleted within 24 hours. If you find any content that is violating the copyright law, please send me an e-mail and we will remove it immediately. Please support the artist. Deep funk is a term used to describe obscure funk recordings that appeal mostly to zealous collectors and groove fanatics. Like deep soul, the term deep funk can evoke the strongly African-American essence of the music, but deep funk also carries the connotation of a collector digging through crates of old records, looking for that special rare, underground find. It can be vocal or instrumental, but in most cases, it's about rhythm, groove, and musicianship, not songwriting. Deep funk rarely innovates within the form, generally taking its cues from the hard, lean brand of funk epitomized by James Brown and the Meters, or -- depending on the level of musicianship -- moving into jazzier, more improvisational territory. Some of it was recorded for major labels and lost in the shuffle, and some was cut for small independent labels with poor distribution. Whatever the specifics, deep funk represents the sound of funk on its most elemental, grass-roots level; it's something akin to the way '60s garage bands enthusiastically copied their favorite British Invasion or psychedelic records -- some was truly inspired, some just competent, some instantly forgettable.